Male: Grey back, red underparts and cheeks, black wings and cap, white rump. Female: Like the male, but brown back and pinkish-fawn underparts and cheeks. The Bullfinch is a quiet, secretive but heavily built finch that usually spends its time among the branches and dense undergrowth of woodlands. Both sexes have a stout black bill, black wings, nape, crown and chin, and a white rump, under-tail coverts and wing-bar. The tail is slightly forked and the legs are brown. The handsome male has a blue-grey back and bright rose-pink breast, belly and cheeks. The female has a brown back and pinkish-fawn underparts. The juveniles are like the adult female, but do not have black caps. In the winter, our resident population can be joined by "northern" Bullfinches from northern Europe. 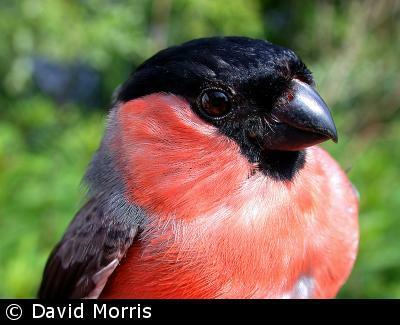 These are slightly larger and heavier and much less shy than our own Bullfinch, and the male has a more intense pink breast and very pale grey upperparts. In keeping with its quiet nature, the Bullfinch's song is a quiet warble. However, you are more likely to hear its call, which is a piped "phew". 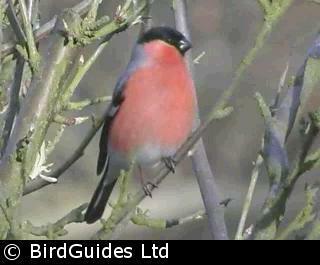 Bullfinches usually feed on insects, berries, seeds (e.g. dock, nettle, bramble, ash, birch, honesty), and buds - its liking for the latter has made enemies of some gardeners and fruit growers. When they visit the garden they usually take seed from a hanging seed feeder or suet cake. Bullfinches usually nest in shrubs or bushes, such as blackthorn and hawthorn, in woodland, orchards or agricultural farmland. The nest, which is a flimsy, loose structure of twigs and moss lined with fine roots and hair, is built by the female. 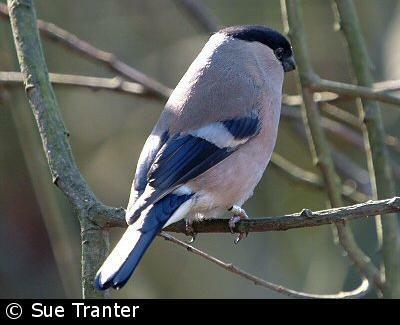 The female Bullfinch lays and incubates eggs that are smooth, glossy and light blue with purplish markings at one end. The eggs are about 20 mm by 15 mm. Both parents feed the young after they have hatched. 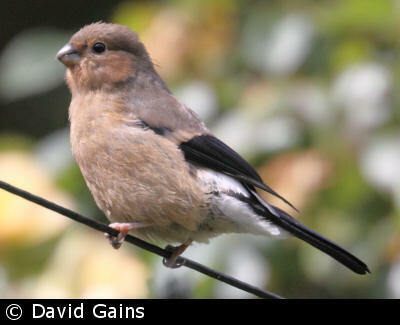 British birds are chiefly resident and sedentary, but they may be joined by Scandinavian birds in the autumn and spring. For many years the Bullfinch was a red list species because the breeding population had declined by more than half owing to a reduction in quantity and quality of woodland margins and hedgerows and increased grazing by deer, but their numbers have recovered (and continue to do so) and so they have been moved to the amber list.